In this case, mine was a lonely heart searching for a biscuit recipe. More specifically, the biscuit recipe. Some explanation is required. I have always loved Carson McCullers’ writing, particularly The Heart is a Lonely Hunter. Long before I’d ever been to the South, the early morning scene in the book–where Mick takes a cold biscuit for her breakfast–fired my imagination. Good books do that. I pictured myself getting up on a summer morning in some southern state, wandering to the kitchen, pouring a cup of coffee and rummaging in the breadbox for yesterday’s biscuit, then sitting on a veranda (large, old, slightly shabby house with trailing wisteria vine), and listening to the birds heralding the day. Perhaps another early riser walking by would say something to the effect of, “Going to be a scorcher today,” and I’d nod wisely. Such is the scenario the book suggested to me. Now, I am more or less living in the South (depending on where you draw the northern border) and have been defeated consistently in trying to produce a passable biscuit. My efforts usually result in flat, dense disks that resemble hardtack. When I wrote my novel, Nothing’s Ever Right or Wrong, and wanted to represent a young woman on a rundown farm, with limited means and no handy artisan bakery down the street (let alone in the nearby small town), I had her baking biscuits–a lot of biscuits. Last fall, I was doing a workshop on editing, called The Soap on the Rope Mistake. It wasn’t a grammar/spelling/punctuation workshop, but rather one on avoiding common pitfalls in our manuscripts. While discussing the importance of keeping our own habits, desires, and proclivities separate from those of our characters, I explained that although I had Stella baking biscuits on numerous occasions, it was natural to her situation. I assured my audience that it definitely wasn’t me; I couldn’t make a decent biscuit if my life truly depended on it. Around fifty people were in attendance at the workshop, many of them authors. I talked with a half dozen after the presentation. 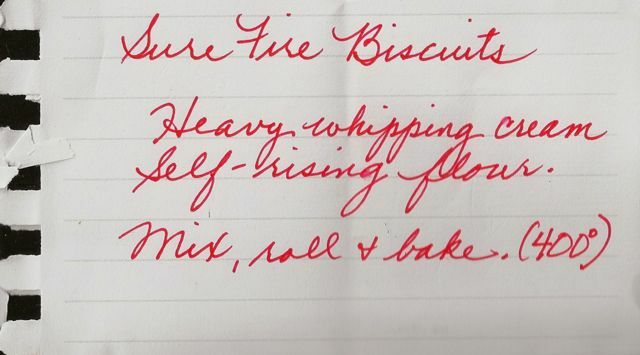 One woman, waiting patiently, handing me a slip of paper with the simplest biscuit recipe I ever seen, and told me I didn’t have to go through life biscuit challenged. I thanked her, put the slip in the notebook, and forgot about it. This spring, I did another workshop, this time on memoir, and discovered the same woman was present. She asked if I’d ever made the recipe and I told her, “Not yet, but I will.” This morning, I tried it. To my astonishment, I made a pan of perfect biscuits that tasted as good as they looked. 1) The people who offers constructive criticism, advice, or insight don’t have to be fellow writers or literary critics; they can be bricklayers, nurses, farmers or stockbrokers. They can be any age, gender, religion, culture, or political leaning. They can be highly educated or marginally literate. Whoever they are, they know about things that we don’t; they’ve lived moment we never will; they’ve experience emotions that are foreign to us; they have something to say and, if we intend to write about their world, we better listen. 2) If other writers offer to read or edit your book, don’t be surprised if they to give in to the urge to rewrite phrases, sentences, even paragraphs. It’s an occupational quirk. Before becoming irate that someone is tampering with your precious words, make a cup of tea and regain your objectivity. Maybe they are right? Maybe they do see a more succinct or dynamic way to convey an idea. Maybe not, but consider the possibility. 3) Don’t shoot the messenger. If your manuscript is returned to you bleeding red ink (think intensive proofread), and you find out you violated one of the common rules of punctuation, grammar, or syntax, curb your impulse to scream, curse the copy editor, or go into deep denial. It happens–even when we know the “rules” but, for some reason, have developed a mental block to the point that, no matter how many times we’ve done our own proofread, the errors have remained undetected. At this point, you may need something stronger than tea to regain your objectivity. Thank your editing friend and fix the errors. Your hurt pride may take a bit longer, but it’ll heal and you’ll be grateful in the long run. And me? Tomorrow morning, with temperatures in the high 90s, I will pour a cup of coffee, rummage in my cupboard for a day-old, cold biscuit, sit out on my deck, and salute all my reading friends, copy editors, Mick, Carson McCullers, and the woman you passed me that magic slip of paper. It’s next to impossible to ignore breaking news, even for dedicated writers who resolve to leave the newspaper folded, the television and radio silent, the tablet or phone unchecked. One way or another, the news of the day creeps into our consciousness. Unless we live a hermit’s life, ensconced in a cave, we know that over the last few weeks two convicted killers escaped from a prison in upper New York State. We know lawmakers have made landmark decisions, resulting in celebrations, protests, speeches, and posturing. People have carried out brave acts as well as foolhardy ones. We know innocent people have died. We know fires have ravished communities in the West. We know record heat has baked part of the nation, while other areas have floated on flood waters. If we are writing fiction, it can be difficult to ignore the real world while creating an imaginary world in our stories and novels. Reality creeps into our psyches and our work, often to the point of distraction. One solution is to use the news in a creative fashion. Writers frequently adopt major events, particularly tragedies such as 9/11 and Hurricane Katrina, as a setting or backdrop for their fiction. Sometimes those events mirror their characters’ actions, sometimes they are only used to establish a public mindset. Terrorism, extreme weather, crime, and dramatic stories of survival are all fodder for the writer, as are the humorous articles, the world of celebrity, and everyday miracles. But, how many times have you read a news article and immediately formed an opinion, thought of ways to solve a problem that has been presented, or imagined a different outcome. My father, who lived in a far simpler time, used to use the term “sidewalk engineer,” which is similar to the more widely used term “armchair quarterback.” Not a flattering designation, but also not a bad activity for a writer. Often, the news can inspire us with a plot idea based on our response to actual events. The moment we say, “What I would have done is . . .,” we are forming plot, action, and resolution. Case in point: After the recent escape of the two convicts from the Clinton Correctional Facility, I imagined what I would do if I was one of them and wanted to escape and blend into society. I studied the photos. Sweat, the younger man is ordinary looking, with unremarkable features. Wearing the right business apparel, and swinging a briefcase, he could walk down most major city streets and, if noticed at all, would appears to be an office worker going to or from his job. Matt, the older man, with heavy features and probably a fast-growing five-o’clock-shadow, would have a harder time, but give him a hard hat and a lunch box and he could pass by unnoticed as well. Frequently, when we see symbols that identify people by profession, we often don’t take a second look. Fiction, however, allows us to take liberties with the reality of what is perceived, so we can discover what is hidden just below the surface. Identity, motive, method–all can be changed with a few keystrokes. No one wants to plagiarize or be accused of wholesale copying a news event and calling it an original plot. A “What would I do. . .?” moment, based on a single act or situation, is neither. Drawing on our knowledge and experience, to realize a different scenario, is simply a writing tool. If a blank computer screen is your nemesis today, turn on the radio, flip on the television, or pick up a newspaper and let the ideas flow.